The calendar is telling telling me that today is March 14th (not only do I not retrieve my mail on a daily basis, I also am that person who never knows the date). If today is truly the 14th of March, I have a half to run in a month from today as the Fitness Mag Half is April 14th. Hmm. That is soon. I guess when you wait until the last minute to register, it will seem to creep up on you rather quickly. How do you hydrate for your runs? I notice I am much thirstier on the days that I run and sometimes water just doesn’t cut it. I am not a big fan of sports drinks or drinking my food (I prefer to chew) but I am open to suggestions! I have read so much about the benefits of smoothies in terms of the body absorbing the nutrients quicker and better from the blending that I am thinking maybe I need to whip out my blender on a regular basis. So, last night the boy and I tested out a new fun (and healthy!) dessert- remember I was going to make a version of the Pin from Pinterest? I didn’t have waffle cones but I did have cupcake cones. I told him the plan: choose a yogurt flavor, a few different toppings/mix-ins and then we will pop it into the freezer for it to harden like ice cream. In addition to sharing my Crunch Time, I even shared my dark chocolate chips. I must have been in a good mood. 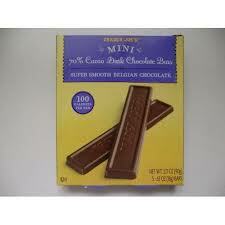 Ok, lately instead of the dark chocolate chips, I have been eating the Trader Joe’s Mini Dark Chocolate Bars on a regular basis. So I didn’t mind giving up some chips. 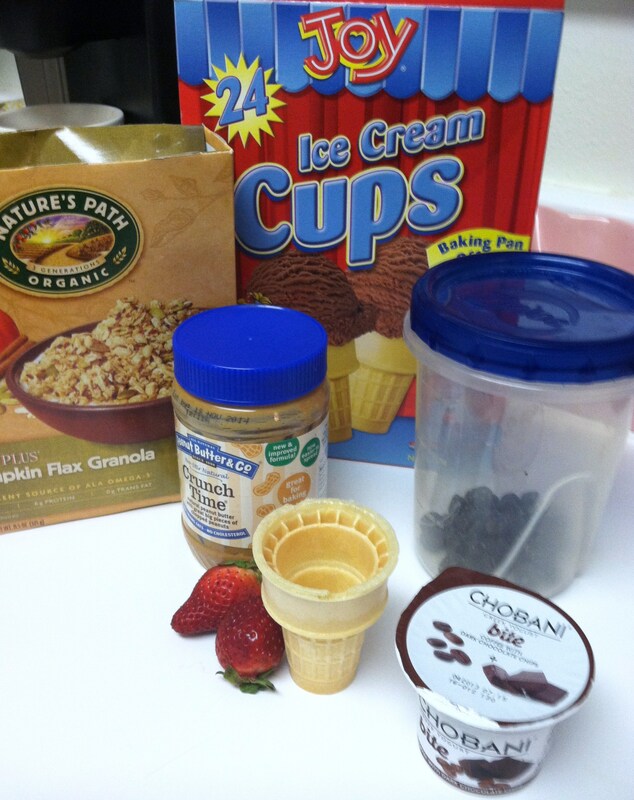 We assembled the cone with a scoop of peanut butter at the bottom, then the yogurt, mixed in the granola, a few chocolate chips and topped with the strawberries. It was super easy and not messy at all! (I hate a mess and prepared myself for yogurt drippings-but there were none). We popped it into the freezer and waited for it to harden. Now, we only made it about 90 minutes. He couldn’t wait any longer than that. It was close to frozen, but not quite. I think it probably needed another 30 minutes to an hour. He totally enjoyed it. And I enjoyed that he enjoyed a pretty healthy dessert. Another Win Win Mom Meal! I will absolutely be making these again and trying out different combinations. 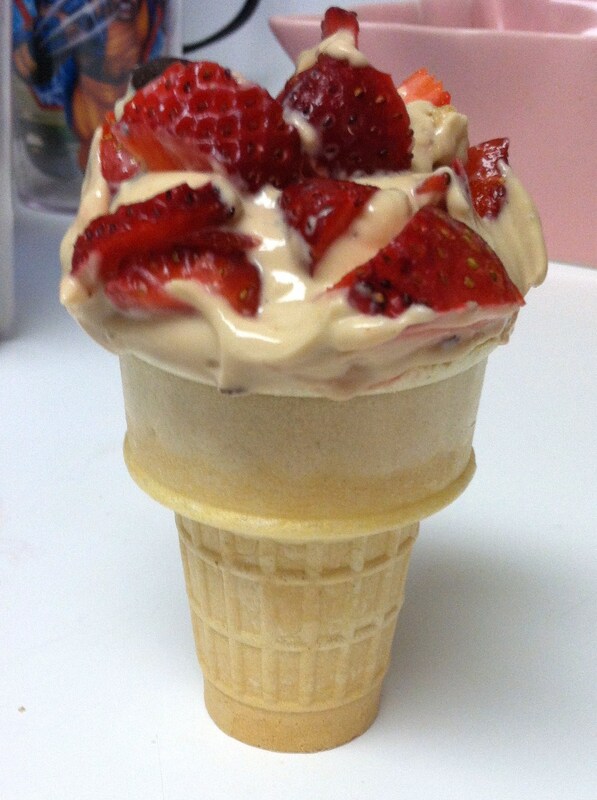 I love that he chose strawberries as a topping. I am thinking we need to try fresh pineapple and raspberries as well since they both taste delicious in desserts, especially with chocolate. 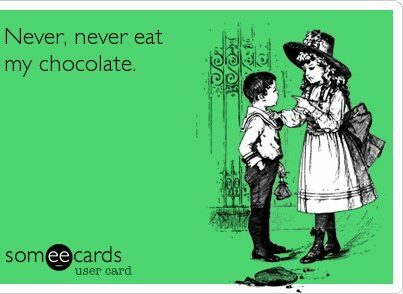 And with peanut butter, but doesn’t everything taste delicious with peanut butter? It’s all about the toppings, right? 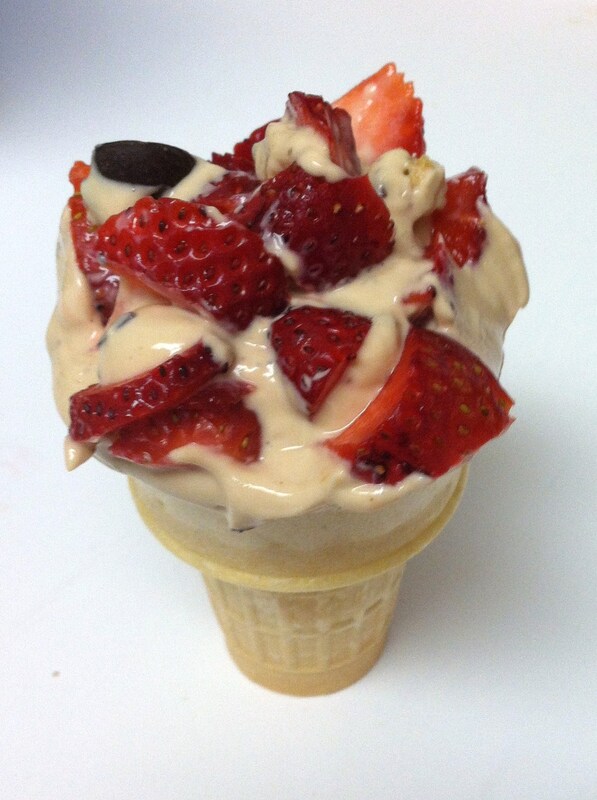 So why not use greek yogurt as the base – turns into quite a healthy dessert treat. I am thinking that I want to buy the waffle cones and,the waffle bowls. 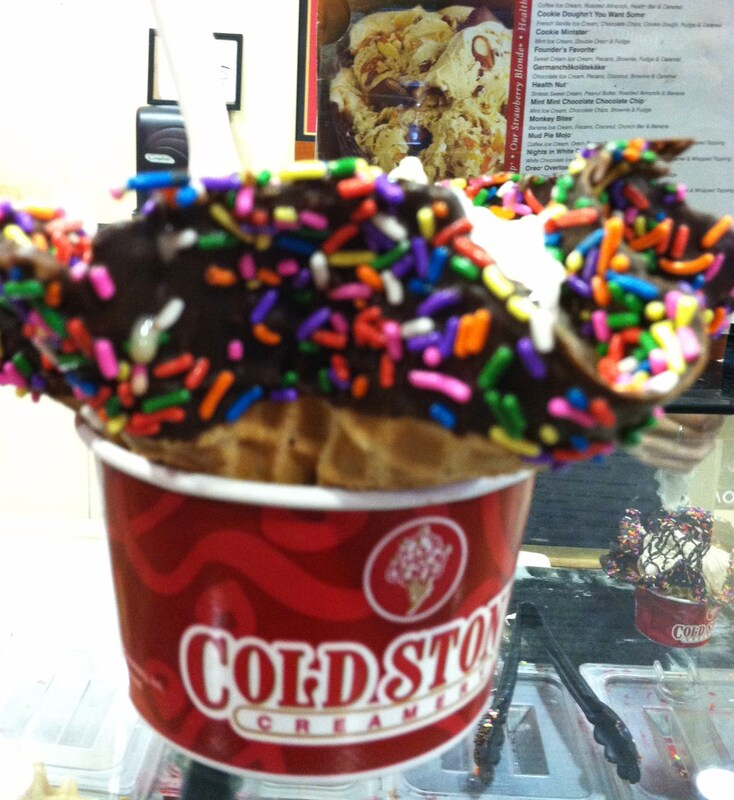 Heck, maybe I will start chocolate dipping the waffle cones and bowls and make my own dessert creations like my favorite desserts from Cold Stone Creamery. Perhaps I should start making room in my freezer. If you missed the Kidfresh giveaway post, click here. Hi! First of all, your mother is a former professor of mine and she means the world to me- so happy she introduced me to your work! Secondly, thank you for sharing your adventures. What a treat for us! Third, it’s so great to know that there are exercise enthusiasts out there who love to eat as much as I do! Okay on to business. Apart from being a student, I am also a runner and an avid spinner, like yourself. In fact, I teach spin 3 times a week and I love every minute of it. That said, it’s often hard to hydrate before a workout- be it running or spinning. Nevertheless, I’ve learned a few tricks along the way that have helped me stay hydrated between school and my workouts, and life in general. 1. Say no to coffee (such a huge dehydrator and every runner’s nightmare). It depletes your body of water and if consumed before a run can make a 45 minute workout feel like a 2 hour one. 2. Say hello to oranges. Eating oranges is a GREAT way to fuel your body with a ton of vitamins, nutrients, H2O and antioxidants (peace out wrinkles). Now I know why all the moms brought oranges to soccer games back in the day…. Moms really do know everything…. 3. Say hello to cantaloupe and watermelon. Just like oranges, these 2 fruits consist mostly of water, which when consumed directly hydrate the body. While watermelon isn’t exactly in season right now, cantaloupe is and it makes my heart sing. Anyway, thanks again for writing and sharing and keep up the awesome work. Thank you so much! I now have a few more questions for you lol – are the cantaloupes sweet yet? I hate buying before they are sweet. As for spin, I would love to know why I find the squating position so much harder than the standing straight up position. My instructor always says squat is easier but I don’t think it is…I know I shouldn’t drink so much coffee but I just love it in the morning – it is so hard to give up! Today I had a quick smoothie/drink before my run and it helped with my thirst issue. Instead of just eating a handful of berries, I threw them in the blender with some ice, spinach and a little water. I did the MORE 1/2 a couple years ago. I got a little bored doing 2 laps in CP, since that’s where I would run everyday, but it was really cool that it’s an all womens event…a lot of positive energy! I LOVE smoothies and make them pretty often. They are great with some protein powder after a long run. It seemed like a fun half to run. And since I don’t normally run in the park, should make for change of scenery for me! Which protein powder do you use? I don’t normally buy protein powder but I’ve been considering it. I should for the added protein since I’m vegetarian. I’ve been experimenting with different brands, but I tend to go with whey and almost always vanilla flavor. there are some full vegetarian options out there too. Wow, that dessert came out looking great! You’ve inspired me to create something ‘healthy’ as well. Thank you! I hope you create something delicious! 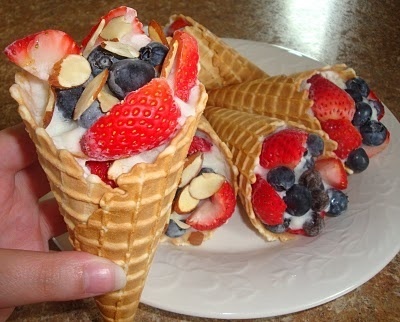 Try the yogurt cones, they were easy and good. How awesome would that be?! At least I know I would have a fabulous logo and awesome staff shirts!